The Dylan Thomas Theatre TheatreThe Dylan Thomas Theatre is Swansea's only waterside theatre venue. We are a thriving community theatre in the heart of the Maritime Cultural Quarter, located in the SA1 area of Swansea and we currently attract over 15,000 visitors per year. We pride ourselves on the diversity of our programme, which showcases the work of educational and community projects from throughout the region. 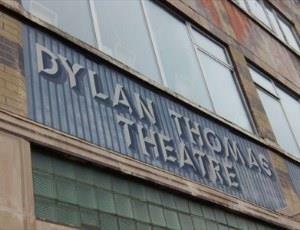 The Dylan Thomas Theatre has been the home of the multi award-winning Swansea Little Theatre for over 30 years. We are a registered charity with a membership of over 150 actors and technicians, all working on a voluntary basis. Our theatre has undergone major redevelopment, following the award of a major Arts Council of Wales grant. Our foyer and bar, the Ruby Graham Room and the theatre is now fully accessible to all with ramps, lowered bar and box office and disabled toilets and shower. Panels in the theatre tell the story of Wales` most famous poet, Dylan Thomas`s time as an actor with the Swansea Little Theatre in the 1930`s. We try to open the theatre to the public Monday - Friday for 4 hours 10:00 - 14:00 and we have visitors from all over the world as we have a display of unique panels showing scenes from plays in which Dylan Thomas appeared. We have murals on the outside of the building showing Dylan Thomas, Captain Cat and Polly Garter and the theatre is opposite the iconic Dylan Thomas statue, next door to the Tram Museum and close to the Waterfront museum.